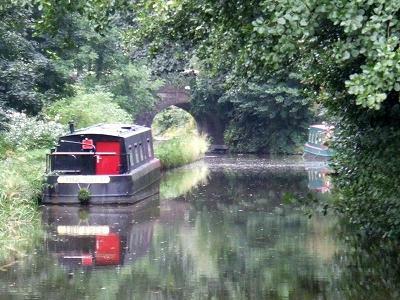 The Churnet Valley sections of the Caldon Canal are some of the most picturesque in Britain. Once bustling with industry, it has been reclaimed by nature and only the occasional steam train or boat engine disturbs the peace. 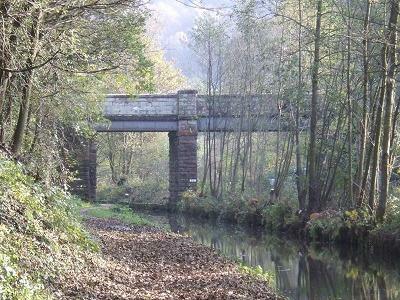 The Caldon Canal is a backbone of access to the Churnet Valley, with or without a boat. Where the railway threatens you with a £1000 fine for trespassing, the canal has a nice flat towing path. When James Brindley's Grand Trunk Canal was nearing completion in the early 1770s, it became clear that its water supply was inadequate. The biggest problem was the summit pound in Stoke on Trent, which threatened to run dry in summer. The solution was to build a branch canal to tap the plentiful rainfall in the Staffordshire Moorlands, where, in addition, there were also large reserves of limestone for cargo. Brindley was sent to survey the line but this task was too much for his failing health and he died soon afterwards. After his death, his brother-in-law, Hugh Henshall, took over. Eventually, after one or two options were discarded, a plan was adopted that would take the canal through the Churnet Valley to Froghall. In doing so, it would take in the coal mines of that area, but bypass the town of Leek. 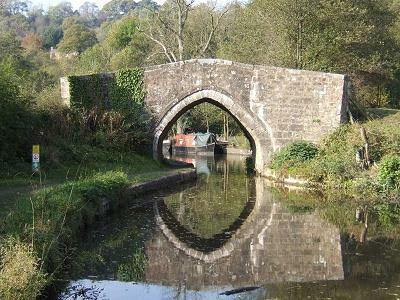 The connection to the limestone quarries at Caldon Low, from which the canal got its name, was to be made by a railway. The canal was dug as far as what is now called Froghall Old Wharf between 1777 and 1778, when the canal and railway were opened for business. This first arrangement, however, was not a success, mainly because of trouble with the railway. To remedy this, a new act of parliament was obtained to re-lay the railway on a new route and to extend the canal through a tunnel to the railway's new terminus at the Froghall Wharf that exists today. For accounts of days spent walking the canal from Stoke, see the Stoke To Leek and Stoke To Kingsley Holt walk pages. For an account of the trials and tribulations of the railways and tramroads, see The Caldon Low Tramroads page. It soon became clear that the Caldon Canal on its own could not solve the Trent and Mersey's water problems. In fact, the Caldon itself now had supply problems which restricted its own trade. So, a big new reservoir was planned for Rudyard, northwest of Leek, to feed water into the summit level at Hazlehurst. The original plan envisaged a simple feeder channel but the people of Leek, unhappy that the Caldon Canal hadn't come their way in the first place, had other ideas. Thus, the section of the feeder between the southern edge of the town and the canal at Hazlehurst was built as a navigable canal, with a further length leading to a basin in Leek itself. The canal was never busy, carrying mostly raw materials and finished products for the mills in Leek, along with some coal for industrial and domestic use and some general agricultural and domestic cargo. The two arms of the canal enter the Churnet Valley on opposite sides of the valley occupied by Endon Brook. This was once the course of the Churnet itself, until glaciation forced it into its current course. To join the main line at the summit level and, thus, deliver the water to where it was needed, the Leek arm had to cross this valley on a high embankment. The summit level of the Caldon was then extended along the side of the valley to meet it. The locks that had previously lowered the main line towards Froghall were replaced by a triple staircase at the new junction. The staircase, however, proved to be a bottleneck and a waste of water. It was, therefore, abandoned, to be replaced by the layout which stands today. A new junction was constructed further back along the summit level and a new section of canal was added, with three individual locks, which lowered the main line to pass underneath the Leek Arm, which was carried over the top by a new aqueduct. After a few teething troubles, the canal was a commercial success. It was used to carry anything and everything, including coal, limestone, ironstone, bricks, timber, pottery materials and agricultural products. It continued to be successful, even after the railway takeover in the 1840s. When ironstone was discovered in the 1850s, it triggered a boom in carrying to the steelworks at Shelton. Conveniently, this also increased the demand for limestone, which was used as a flux, to remove impurities from the iron during smelting. The decline began after the First World War. Some industries, such as coal and ironstone mining, closed down entirely. For the remainder, as with other canals, rail and then road competition began inexorably to erode traffic levels. Neglect also played its part, including a lack of dredging which reduced the loads that could be carried. By the 1950s, it was almost disused and some sections were derelict. Finally, in 1961, a closure notice appeared at Etruria. The canal was never entirely abandoned because the water supply was still needed for the main line of the Trent and Mersey. However, it had fallen into a terrible state before volunteers began the long process of recovery. After a good deal of hard slog and a lot of money spent, the canal was restored to navigation in 1974 and upgraded to full "cruising waterway status" in 1983. Challenges remain. The canalised river section is heavily infested with Himalayan balsam: an ornamental but highly invasive species that loves damp river banks. Some sections of the canal are confined to narrow concrete troughs to combat long-term problems with leaks and slippage. 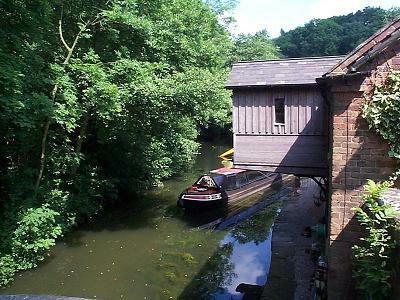 At Froghall, the tunnel leading to the New Wharf and the Uttoxeter Branch is too low for many boats. If those boats are also longer than about 65ft, the winding hole at the Old Wharf is too short for them to turn around. Restoration of the filled-in basin next to the derelict warehouse would solve that problem and restoring the warehouse would be nice, too. Neighbouring the canal at Froghall is the Boltons Copper Works site. This presents both biggest problem of unsightly dereliction and potentially the biggest opportunity for redevelopment. Demolition work in 2008 cleared many of the buildings which were derelict, at that time, but there was considerable disagreement over what should replace them. The original plan, for 200 houses and a hotel, was strongly opposed, locally, and seems to have bitten the dust. Plans for the Churnet Valley Railway to take over part of the site also seem to have stalled. A "mixed scheme of housing, tourism and employment" seems to be the favoured option now but an economic recovery is probably needed, first. More recently, Thomas Bolton Limited has gone into liquidation, leaving the remaining copper-works buildings disused and it seems likely that these will now be demolished, too. While this is a crying shame for the workforce, it should open up the opportunities for development even further, if the ideas are right and the rampant NIMBY-ism of some of the local inhabitants can be overcome.